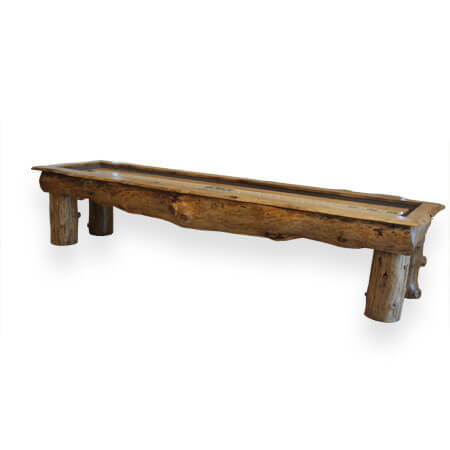 9′ Log style shuffleboard table. Custom made to order out of real ponderosa pine logs and stained in a beautiful medium stain. The finishing process also includes a coat of sealer and lacquer to ensure maximum durability of your shuffleboard table. Our shuffleboard tables also feature a neutral grey carpet along all the inside walls and gutters. The playing surface is made out of 2″ thick strips of maple hardwood glued up butcher block style to approx. 19.5″ wide. It is then poured with an 1/8″ of clear epoxy resin. We also include 1.5″ thick weather bars to keep your table nice and level for as long as you own it. Custom images can be added under the epoxy resin at no extra charge if the vinyl sticker is provided by the customer. The outside table dimensions are approximately 9′ X 3′. This table also includes a lifetime warranty against all manufacturer defects for as long as you own it, but please keep in mind that because this is a very rustic product there will be knots, splits and cracks that will not affect the integrity of the table. We can customize the table however you want but it may add to the cost so please call or email with any questions!